This time on out to lunch we’re visiting Boiling Point in Irvine for Hot Pot, an Eastern Asian stew consisting of a simmering metal bowl of stock on a burner charged by Sterno filled with vegetables, tofu, blood cake, clams, cuttlefish, fish cakes, and other tasty treats. Unlike Shabu Shabu, where meats and vegetables are dipped into a simmering stock, then eaten, hot pot has everything in it. You just pick out your food, dip it in an optional sauce, and eat. 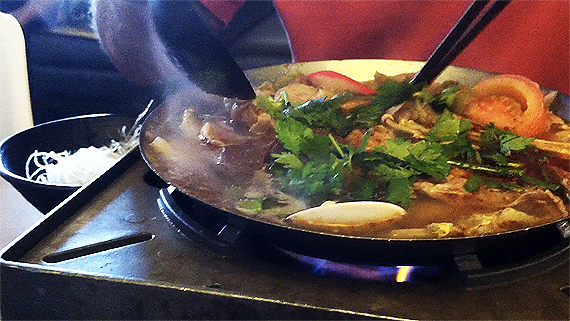 Comforting and delicious, Boiling Point is the perfect lunch time stop on a cool Fall or Winter afternoon. Watch this episode of Out To Lunch.